A salad at Pinstripes inspired a food blogger to create and share this restaurant copycat recipe. Assemble the equipment and ingredients. Heat vegetable oil in a large frying pan. Meanwhile, and in a small bowl, prepare the egg wash by whisking together 1 egg with 1 tablespoon of water. Into another small bowl, pour the 1 cup of Italian bread crumbs. Dip the tortellini in the egg wash, then dredge in the bread crumbs. Fry the tortellini, a few at a time, in the hot oil. Fry until golden brown. Remove from heat and transfer to a paper towel-lined plate. 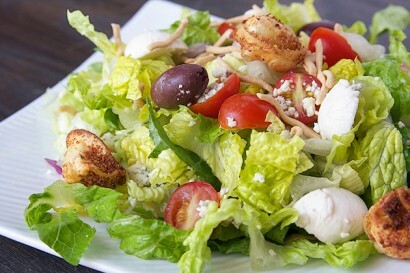 In a large bowl, toss together the lettuce, tomatoes, cheeses, olives, beans and onions. Add the fried tortellini and chow mein noodles; toss lightly. Top with Greek vinaigrette; add optional grilled chicken or seafood, if using, and serve immediately. Adding fried tortellini and chow mein noodles last keeps them from getting soggy.